Do you ever have cardboard boxes that you don't know what to do with? 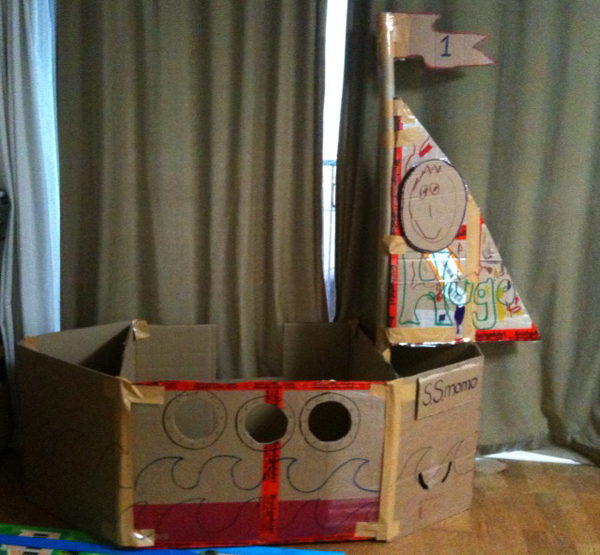 How about build an awesome fort or kid's cardboard boat! A long time ago a sweet reader from Japan sent me this photo of what they made for their son Hugo and while going through some files today I came upon it again! Isn't it rad?! Next time we have some boxes lying around I know what we'll will be making. Thanks Ruth for sharing. That's such a cool picture! I remember having so much fun with moving boxes when I was younger...my brothers and I made a few boat boxes back in the day! such a wonderful idea! especially getting the kids involved and letting them decorate. Great idea, although my kids are also thrilled with just the plain box! so creative and earth friendly! there was a time when all we needed to be happy was a paper boat or castle.... its never too late to start again. with our kids this time. thanks for sharing. .....thanks for posting that Rachel..:)our next lot of deliveries will be coming during August and with those boxes my husbands' planning to try a Japanese temple!! You have got to see the most amazing cardboard studio at http://hutchstudio.blogspot.com/. It is so amazing. In Yorktown, Va they have an annual cardboard boat regatta! Very cool. I can totally imagine kids pretending to be moving swiftly across the oceans in that cardboard boat! It's beautifully constructed and lovingly decorated! Now if I can only find boxes in my size, I'd love to make one for myself….